Threads that can run managed code can be classified into two types. There are threads that are created by the CLR, and for such threads, the CLR controls the base (the starting frame) of the thread. 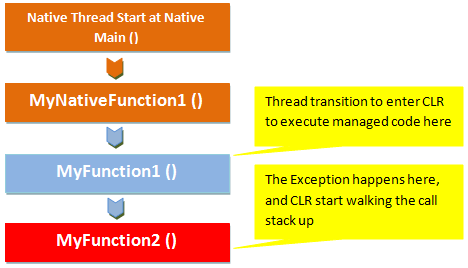 There are also threads that are created outside the CLR but enter it at some later point to execute managed code; for such threads, the CLR does not control the thread base. 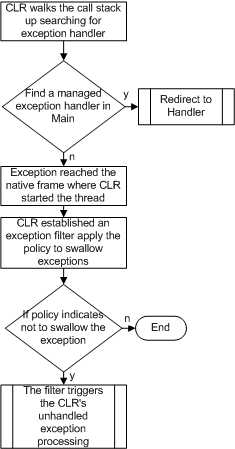 In the .NET Framework 1.0 and 1.1, unhandled exceptions on threads that were created within the CLR were swallowed at the thread base (the native function at which the thread started in the CLR). Which is, the behavior we don’t want, since the CLR has no clue about the reason the exception was raised in the first place. Thus, swallowing such an exception, is a mistake since the extent of application or process state corruption cannot be determined. What if the exception was the kind that would indicate a corrupted process state such as Access Violation, for instance? In the .NET Framework 2.0, this behavior was changed. Unhandled exceptions on threads created by the CLR are no longer swallowed. 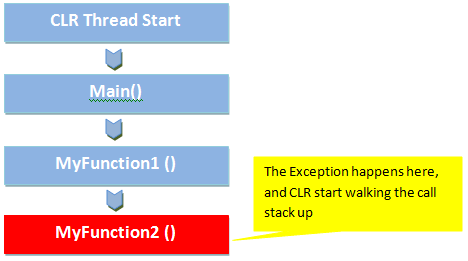 If the exception is not handled by any managed frame on the stack, the CLR will let it go unhandled to the OS after triggering the unhandled exception process. The unhandled exception, then, will result in an application crash. Those kind of exceptions is dangerous and the best scenario most of the time is to stop processing as quick as you can before you lose user important data or cause the application to behave in unexpected ways. A sample scenario of when those exception could happen like the following scenario, if you try to run this sample code while you another process accessing “file.txt” you will got Access Violation Exception. In .Net 2.0 you can catch and swallow this kind of exceptions as in this code snippet; But this will not be the case anymore, which means that the catch statements will not be able anymore to see this Corrupted State Exceptions, and no matter what they will popup and stop the process of continuing its work. The CLR team knew that there are some rear circumstances that you will need to handle those Corrupted State Exception “ The Super-Exception “, may be for doing some log routine but not to continue processing. So CLR 4.0 provide a new attribute called HandleProcessCorruptedStateExceptions, you can use to decorate the methods you want to use in doing some log routines or whatever notification scenarios about those super exceptions. 5:     // log, or Send Mail etc ..
Also for backward compatibility purposes CLR 4.0 provides a new process wide compact switch you can easily set to have the old behavior of catching those Corrupted State Exceptions as in previous versions of CLR.